Failed to bring up eth2.210. Nearly two years ago, I started thinking about a next generation design for the Freifunk Hochstift backbone infrastructure, motivated by the limits and design choices made before (we were young and didn’t know better.. or didn’t listen..). This post is the starting point of a series of posts about building a software defined wireless ISP network with Linux, a fistful of Open Source tools and low cost hardware. Over a year ago we (the Freifunk Rheinland Backbone Operators) organized the FFRL Routindays, a two day event where we gave a hands-on trainig on “How to build the Internet” or any internal network. As of periodic quesions about where to find the slides and videos here’s a summary of all media available of this event. The event has entirely been in german language, as are all slides and lab guides. 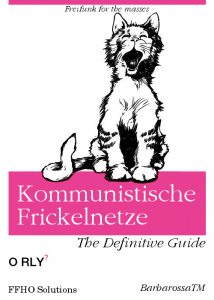 This is provided in the hope, that it still might be of some use even for non-german speakers. The complete slidedeck is available here. Thanks to the CCC VideoOperation Center, there are recordings of the event avilable on media.ccc.de, too.